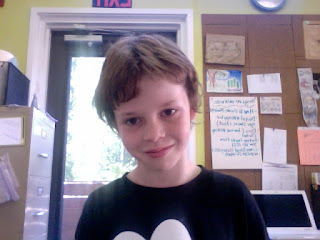 The Forest Ranger this week is Levi. This week's Ranger is Levi. He is nine years old. He was born in North Carolina. His family includes his mom, dad, and younger brother, Micah. He has two cats, Copper and Sebastian. The thing he likes to dow when he is at home is play with his brother and play video games. His favorite food is his dad's spinach, dad's chicken parmesan, and ice cream. The food he dislikes the most is raw eggs. His hobbies are building, playing basketball, and taking pictures. (Check out his blog which showcases his pictures.) When he goes on vacation he most likes to go to Bald Head Island. His dream vacation is to go to China. Levi is really good at playing video games. When he grows up right now, he would like to be a video game designer. Parent-Teacher Conferences are Thursday, October 20th and Friday, October 21st. If you have more than one child attending Carolina Friends School you should have already been contacted by the Center office to schedule your conference times. In the next few days you will receive information from your child's small group teacher to set up a conference time. We look forward to meeting with you about your child's progress! If you have extra shoeboxes, wrapping paper rolls or paper towel rolls, please consider donating them to Kathy for a project. You can send them in with your child to Forest Class and we will make sure Kathy receives these items. We are entering jacket and coat season. Please consider putting your child's initials or name inside of their jackets and coats. It is easier to return lost items to the owner if we can find the person's initials or name on the inside.